Discover the real fountain of youth. Come Colonial Dancing! We not only have fun and stay fit but also help to preserve the cultural heritage of Australian traditional dance and its music. Our dances are a mixture of set dances and couples dances, which makes them unique among the social dances. Set dances are excellent “mixers” where dancing couples are arranged in lines, squares or circles. And there is nothing quite like couples dances for making friends! There is a “caller” who announces what to do throughout each dance. There is usually a walk-through, a demonstration, or just a quick explanation beforehand. You don’t need to bring a partner. Dancers are encouraged to change partners throughout the night. Interested? Check the rest of our website and if you think you might enjoy this type of dancing we would love you to join us. Elsewhere you will find an overview of our Program, with links to details of classes, dance and special events that we organise. We are part of a wider community of social dancers in Australia. You will find similar dance groups in other States and Territories, and they are great people to connect with while travelling. Many dancers from around Australia take the opportunity to meet and dance together during Easter each year at the National Folk Festival in Canberra. You can find some of these through our Links page. Notices of updates to this website are posted on a Yahoo email group called ‘Melbourne Folkies’. Most updates have information about forthcoming events or photos of recent ones. Anyone can send an email to "Melbourne Folkies" and ask to be included on their mailing list, or just go to their website to find out more. 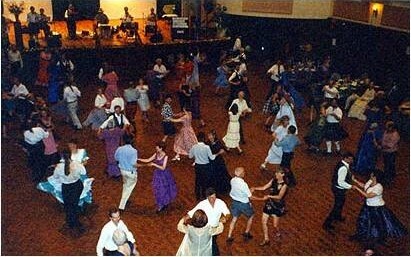 Indulge your dancing feet – come Colonial dancing! With the new year started, Wednesday night classes are continuing at Collingwood - see here for details - and beginner classes have started up and everyone is welcome: see here for details. Our June Ball is coming up: There are now more details on our Ball Page, and final poster with all the details. Why not join our MCD meetup group, you will not only get notified of MCD events but also those of other related groups with reminders close to the actual dates - just click on the red and white meetup logo on the the button bar at the top, register and join the MCD meetup experience. Created 5 June 2012 : Last updated 01 Feb 2015.